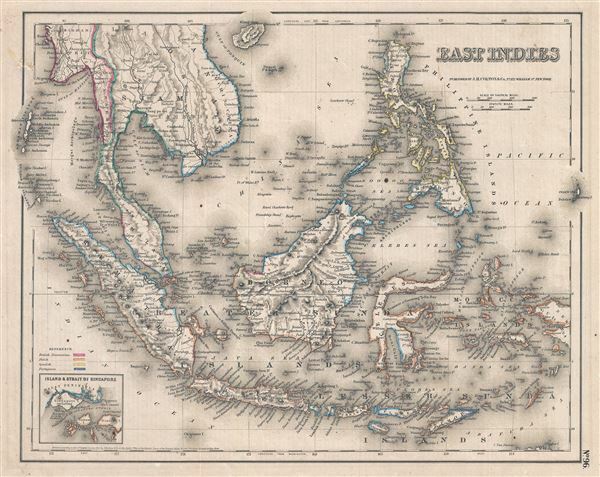 This is a beautiful and uncommon 1857 edition example of Colton's map of the East Indies. Like most of Colton's Asia maps, this map was derived from an earlier wall map of the world produced by Colton and D. Griffing Johnson. It covers from Burma in the extreme northwest to New Guinea and east Timor in the southeast and includes the modern day countries of Burma, Pegu, Siam (Thailand), Cambodia, Cochin China (South Vietnam), Malay (Malaysia), Borneo, the Philippines, Indonesia, and Singapore. This map is significant as it was among the first American maps to detail the Island and Strait of Singapore - appearing bottom left. When this map was made, Singapore, governed by the British east India Company, was experiencing a massive tide of immigration and growth due to its open immigration and free trade policies. Also at this time, Burma was under the British Raj, and much of modern day Indonesia including Sumatra and parts of Borneo were part of the Dutch East Indies. The French dominated Indochina, including Cambodia and Vietnam, and most of the Philippines were a Spanish colony. Of all the nations of Southeast Asia, only Thailand (Siam) retained its national sovereignty throughout the colonial era. This map also identifies various cities, towns, rivers, capes, mountains, and an assortment of additional topographical details. Map is hand colored in pink, green, yellow and blue pastels outlines to define provincial and regional boundaries. Like most Colton maps this map is dated 1855, but was issued in the 1857 issue of Colton's Atlas. This was the only issue of Colton's Atlas that appeared without his trademark grillwork border. Dated and copyrighted: 'entered according to the Act of Congress in the Year of 1855 by J. H. Colton & Co. in the Clerk's Office of the District Court of the United States for the Southern District of New York.' Published from Colton's 172 William Street Office in New York City, NY. Very good. Overall age toning. Minor damage over top left border. Rumsey 0149.098 (1856 edition). Phillips (Atlases) 816.